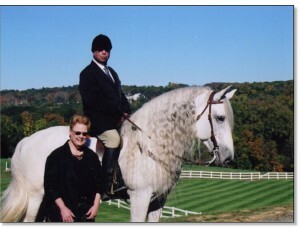 Linda and Allan Hamid became breeders of purebred Andalusians in 1984. Linda Osterman Hamid, a graduate of Georgetown University in Washington, D.C., first fell in love with Andalusian horses while studying at the University of Madrid in 1965. 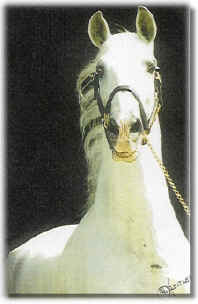 Years later, she introduced her husband, Allan H. Hamid, to the breed with the Andalusian stallion Embajador IX. Ardent admirers of the Spanish horse, the Hamids purchased the renowned Andalusian stallion Embajador IX, imported from Spain, and the beautiful mare Bandolera. Acclaimed for his superlative Spanish bloodlines, Embajador IX was one of the most important stallions brought to America to contribute his noble genes to produce outstanding Spanish horses in the United States. 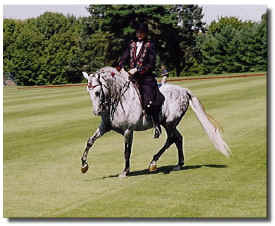 The first purebred colt of Hamid Hill Farm, Ltd. was Embajador XI, trained and exhibited in classical dressage by Bettina Drummond. An avid horseman, educator, Harvard fellow and scholar, Allan combined his interests and did historical research on the extinct knight’s horse. 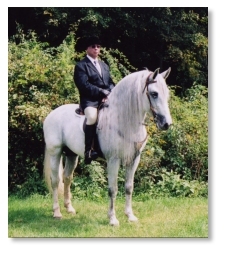 Genetic studies confirmed his premise that blending the genes of the Andalusian and the Percheron would produce the phenotype of the medieval war-horse. 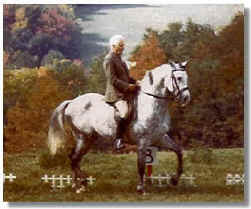 Hamid Hill Farm, Ltd. began breeding these unique horses representing centuries of selective breeding. Owned by Hamid Hill Farm, Ltd. and sired by the late Embajador IX, the “Ambassador” of the Spanish-Norman breed is the magnificent stallion Romantico H.H.F. Embajador IX | Embajador XI | Romántico H.H.F.